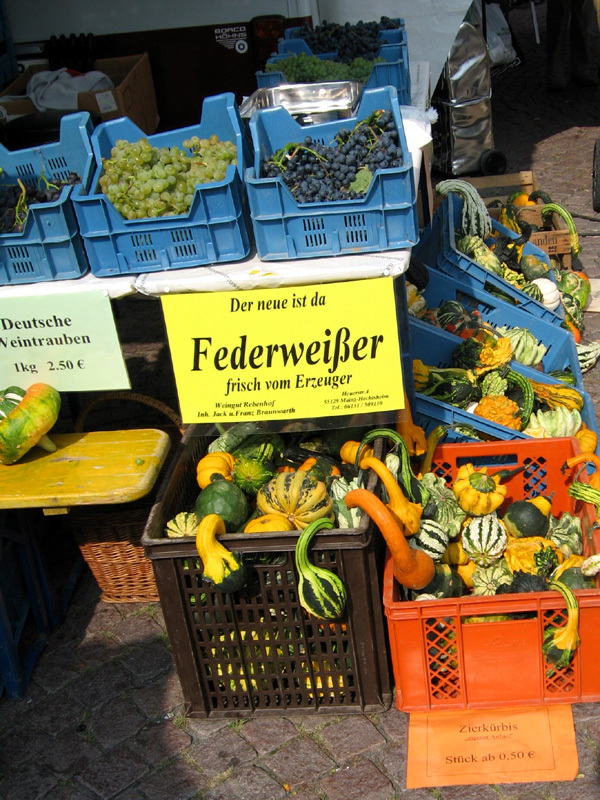 Typical fruits and vegetables for Fall, together with "Federweißer". Federweißer is some kind of really young wine - just a few weeks old - the fermentation had started but was stopped in order to have this young, sweet and fresh beverage; it nearly tastes like juice but it's hard to describe - I'm afraid you'll have to try it for yourself ;) . Photo taken at the market in downtown Wiesbaden. Thanks for doing this--I lived in Wiesbaden as a US Air Force dependent during the 60s, and I love your photos. I check them every day and I just wanted you to know your efforts are appreciated! You could make a lovely hearty pumpkin soup from those. I came by way of the Wiesbaden photo with the "doggie no-no" sign by the tree. Your comment made me howl with laughter. Of COURSE dogs can read... and write... as evidenced by this comment. Humans forever underestimate our abilities, but then... why ruin a good thing? Nap all day... bark at the doorbell.. it's not a bad life. A juice from these? In France they are just used for decoration. How interesting. Would love to try! Please, can we see some Christmas shots of Wiesbaden? You brought back a lovely memory of Zwiebelkuchen abd neu weine. Ah, to be young again. Nice stuff you got, very fabulous pics. Great pics love the fall my garden always looks good in autuum the b&q garden furniture needs covering for winter but the leaves and colors are great. © 2006 Nicola Appel. All rights reserved.